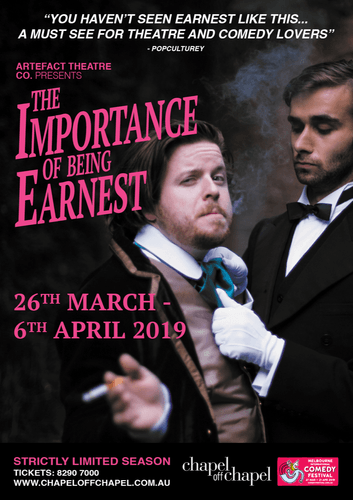 Following its critically-acclaimed, smash-hit opening season Artefact Theatre Co. is delighted to announce an encore production of Oscar Wilde’s exquisitely scandalous satire on Victorian manners, The Importance of Being Earnest, A trivial comedy for serious people. Widely considered one of the funniest plays in the English language, The Importance of Being Earnest’s witty repartee and lively piercing of hypocrisy and pomposity has now delighted theatre-goers for over a century. Set in a world where class, society and fashion are everything; well intentioned young bachelors, friends Algernon (Mark Yeates) and Jack (Rossco Dwyer) both admit to employing different identities when residing between London and the countryside. Jack proposes to Algernon’s cousin Gwendolen (Olivia Solomons) while Algernon falls for Jack’s ward Cecily (Cazz Bainbridge), and each woman falls for her supposed ‘Ernest’. resolve the comedy of errors through her social mores with acerbic wit. These gallants must grapple with mistaken identities, lovers entanglements, and the riotous consequences of their deceptions. "At its heart, The Importance of Being Earnest is a satire of elitist values and hypocrites," explains Director Matthew Cox. "I’ve seen the show many times, but I’ve never seen a production that reached the levels of farcical outrageousness that I had in my head. In a way, this show is about scratching that itch." drinking tea. This is Wilde four absinthes deep on a Friday night, filters of decorum and decency thoroughly abandoned. It’s a show packed with immensely overdressed, overeducated characters who are h*rny, wicked and ravenous, with physical comedy frequently reaching the absurdity of the dialogue." Founded in 2016, Artefact Theatre Co. is a fully independent, self-funded theatre company dedicated to producing high calibre, memorable theatre. Melbourne-based, their past productions include Seminar by Theresa Rebeck and David Auburn’s Pulitzer Prize-winning play, Proof. This latest season promises to deliver yet another lively and entertaining night out for Melbourne theatre and comedy lovers.